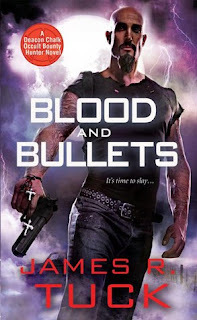 In Blood and Bullets, there was a central theme of vampires. In this book, we are taking a look at Mr. Tuck’s Were society. All I can say is that I have never experienced a universe like this; it’s action packed and very unique. Deacon is back and he is out for vengeance. After saving a were-dog, he and his crew have taken it upon themselves to protect the innocent woman. Pregnant and nearly beaten to death, they scramble to find out what is going on in their town. In Were society there are separate rules and laws. The strong prey on the weak and the weaker just take it. To make matters worse, there are two new factions are in town; one of peace and one of power. Together they wreak havoc on Atlanta, and disturb the somewhat quiet calm that the crew has been enjoying for far too long. Now they have to fight a good fight and protect the weaker Were community. But something doesn't seem right and Deacon is just the man to uncover the truth. Mr. Tuck has done it again. Wow!! This was a very high octane ride. It is fast, furious and well written. He doesn't hold anything back, so if you have problems with violence you will not enjoy this book. But come on, look at the cover…Deacon ROCKS the violence. The fighting isn't sugarcoated and this universe is deadly and unpredictable. The Deacon Chalk: Occult Bounty-Hunter series has found its stride. This hero shoots first and asks questions later. No apologies, none what’s so ever. I was drawn in. His voice is very descriptive; from the characters clothing, their surroundings, and especially Deacon’s man toys. I couldn't help but get immersed into the story. This is Urban Fantasy at its best. This is raw, with only a slight romantic undercurrent. He has even put a new spin on shifters. I was constantly sitting there wondering; OK…I didn't expect that. I really enjoyed that aspect. 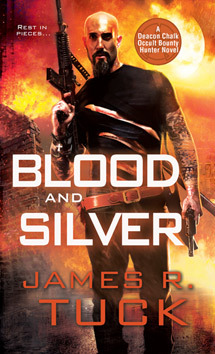 Blood and Silver is refreshing, but in a really bloody gritty way. I do have one note: While reading I did notice reference to prior battles. They were written in a manner that made me wonder if I had missed something. It turns out I did. There are a couple novellas that have been written between the full novels. Did I need them to enjoy the story? No, but I can see how they would have enhanced my reading experience. I can see me going back at a later date to enjoy them, but I have plans to just plow right into the next book, Blood and Magick. I can’t wait! Wanna see how it all started? Check out my review of the first book!